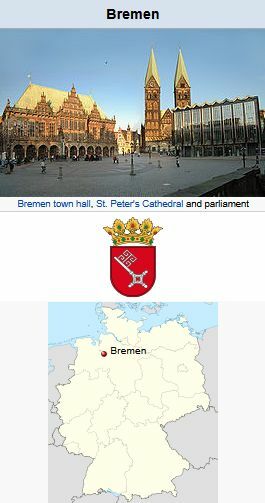 Bremen, Germany, (coordinates: 53.075833, 8.8075 [53° 4′ 33″ N, 8° 48′ 27″ E]) a city of the Hanseatic League, where a second congregation of refugees was organized on 21 November 1947 after the German collapse. It included Bremen, Bremerhaven, Delmenhorst, and the districts of Wesermunde in the north, Rotenburg (Hanover) in the east, Hoya and Diepholz in the south. The membership numbered about 400 baptized and 150 unbaptized persons. Services were held in Bremen and eight subsidiary stations. Ernst Regehr (b. 15 July 1903 at Tiegenhof, minister after 1930 and elder after 1934 of the Rosenort congregation in West Prussia) was the elder until he went to Uruguay in 1948; after 1949 it was Albert Bartel (b. 12 July 1902 at Dragass, Schwetz district, minister after 1939 and elder after 1940 of the Tragheimerweide congregation). He was supported by the ministers of the West Prussian congregations, a deacon, and six elders. The congregation belongs to the Vereinigung der Deutschen Mennoniten-Gemeinden. The elder in 2009 was Ott-Heinrich Stobbe. The congregation met in rented facilities -- at the Gemeindehaus der ev. Kirchengemeinde, Seewenjestr. 98a , Bremen-Gröpelingen and the Gemeindehaus der ev. Kirchengemeinde, Lutherstraße, (Nähe Bahnhof / Delmenhorst). Crous, Ernst and Sam Steiner. "Bremen (Freie Hansestadt Bremen, Germany)." Global Anabaptist Mennonite Encyclopedia Online. 2009. Web. 23 Apr 2019. http://gameo.org/index.php?title=Bremen_(Freie_Hansestadt_Bremen,_Germany)&oldid=91224. Crous, Ernst and Sam Steiner. (2009). Bremen (Freie Hansestadt Bremen, Germany). Global Anabaptist Mennonite Encyclopedia Online. Retrieved 23 April 2019, from http://gameo.org/index.php?title=Bremen_(Freie_Hansestadt_Bremen,_Germany)&oldid=91224. Adapted by permission of Herald Press, Harrisonburg, Virginia, from Mennonite Encyclopedia, Vol. 1, p. 415. All rights reserved.